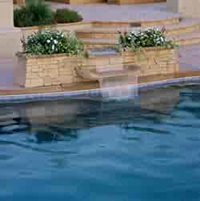 At Johnson Pools and Supplies, we are experts at aquatic design. We can enhance your pool with ornate waterfalls, exciting diving boards, or thrilling slides. We can turn your pool into whatever type of experience you desire. Stop in and visit our showroom or call to see what sort of exquisite design we can provide for you based on your needs for backyard relaxation.